With a diversity of natural and cultural attractions, Lampang, a cosy town in Northern Thailand, has the right appeal for all generations. The spiritual soul of the city lies in the wooden temple of Wat Phra That Lampang Luang and considered as one of the most beautiful wooden temples in Thailand. The impressive structure holds an open viharn or assembly hall, a protective Naga adorning a stairway, and excellent examples of Lanna and Thai Lue architecture. A noteworthy fact, the temple of Phra That Lampang Luang is a zodiac patron for people born on the Year of the Ox. Meanwhile, the pagoda enshrines the hair, forehead bone and neck bone relics of Lord Buddha. Another historical significance here includes bullet holes on the brass railing of the temple, fired by infamous folk hero Nan Thipchang, an ancestor of Chao Ched Ton dynasty, that ruled three northen states of Siam: Chiang Mai, Lampang and Lamphun. 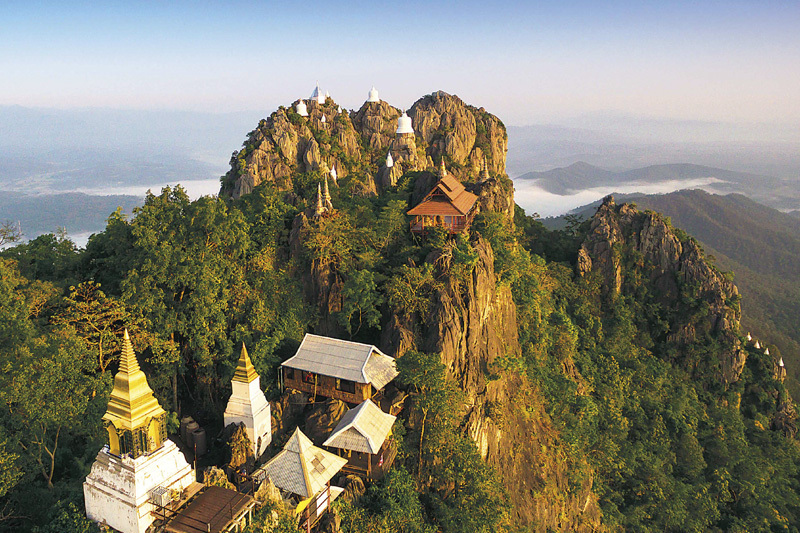 On top of Doi Phra Chan mountain, the temple of Wat Phra That Doi Phra Chan reveals an incredible panoramic view of Mae Tha district. The vista of a green valley against a backdrop of misty mountains depicts your classic Northern Thai image. During the rainy season and winter, the early morning mist enshrouds the whole area, creating a dreamlike image of a serene haven. Worth visiting too is Wat Phra Phutthabat Sutthawat, acclaimed as an “Unseen Thailand” attraction with striking scenic rocky cliffs around the temple itself. It’s worth taking a bus up the mountain and strolling along the 800-metre winding path to enjoy the dramatic and panoramic view of many small white-washed pagodas positioned on rock peaks. Here, the footprints of the Buddha are enshrined in the crown of the pagoda. Chae Son National Park is Mueang Pan District makes a perfect destination for the family and easily visited year round. A large rocky area with many small pools of hot springs water creates a picturesque view in the morning when the soft sunlight shines through the haze from the pools. There’s a choice for a short trek to beautiful Chae Son waterfall to dip in fresh water or wind down in the bathhouses with their large pools and private huts. It’s also good to try a famous snack in the area, Yum Khai Nam Rae (a salad with eggs cooked in the hot springs). For an inspiring experience, visit the Thai Elephant Conservation Centre in Lampang which provides space for an elephant hospital. The hospital emphasizes care for ill elephants and elephant calves. The centre also manages an elephant dung paper factory, and visitors can further enjoy an elephant show and mahout experience to learn more about the pachyderms. To know Lampang better, one exciting activity to do on the weekends is to stroll along Kad Kong Ta walking street. Formerly a colonial trading community, the charm of the place lies in well-preserved buildings and houses constructed in a variety of Chinese, European and Burmese-Tai Yai architectural styles. This is a place to shop for local products, handicrafts, local foods and souvenirs. Cultural local foods and souvenirs. Cultural shows are on hand to entertain the crowd. Lampang also finds fame in its rooster-designed bowl, learn more about the history of this most loved and ubiquitous dish that uses traditional ceramics production techniques. See the exhibition of the world’s smallest rooster bowl, right up to the oldest Dragon Kiln in Lampang. To round out the trip, consider the Lampang rooster bowl as one of the best souvenirs for friends and family.